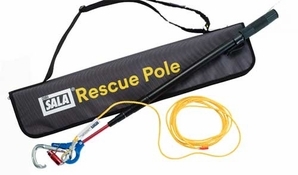 DBI SALA® Rescue Pole - 2.2ft - 8.7 ft with carrying bag, tagline, and carabiner for use in assisted-rescue applications. Free yourself with the help of a colleague. Assisted-Rescue Ring & DBI-SALA Rescue Pole accessory. In the event you’re incapacitated during a fall and are unable to activate DBI-SALA Self-Rescue, the assisted-rescue ring allows for remote access and deployment by a colleague. For added efficiency, the telescoping DBI-SALA Rescue Pole accessory extends your reach and easily hooks into the ring, providing for a safe, efficient assisted-rescue. • Bag Dimensions: Length: 28.5" Width: 6" Depth: 2"
• Rescue Pole Collapsed: 2' 2"
• Rescue Pole Extended: 8' 8"